The Snugpak MML3 Softie Smock is a windproof and water-resistant outer garment with an insulating filling, designed to provide thermal protection on cold days, as well as high protection against wind and rain. The MML3 Smock was developed with the help of professional navigators, mountain leaders, climbing instructors, meteorological staff, and military personnel, and can be used for a wide range of activities including alpine walking, rock climbing and skiing. 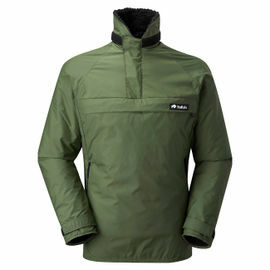 Thanks to the use of its 'Softie Premier' filling, the MML3 Smock is lighter than normal expedition style jackets, making it ideal for trips when size and weight need to be kept to an absolute minimum. It is ideally worn over the top of breathable base layers that allow moisture to be transported away from your body, keeping you dry and regulating your core temperature. 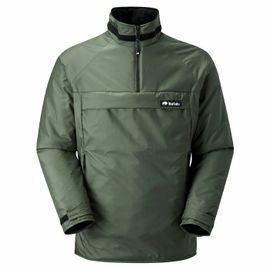 In severe weather conditions, the cut of this smock allows for the layering of additional base or mid layers, while it is also possible to wear the smock underneath a waterproof shell jacket. In warmer conditions, the Softie Smock is light enough to be worn when static for long periods of time. The quick-drying outer fabric has been treated with a Durable Water Repellent (DWR) finish. This water repellency can be maintained throughout the life of the garment with a cool tumble dry cycle after washing, and periodic re-treatment with a suitable aftercare product such as Nikwax. The Softie Smock allows essential equipment to be carried centrally within a spacious pocket on the chest, allowing easy access when wearing a rucksack or climbing harness. This pocket also incorporates two D-rings to secure essential items, such as a compass or whistle, as well as tethering waterproof cases so that they do not need to be carried in an unsafe position around the neck. The MML3 Smock also includes a large outer pocket on the front of the central chest pocket, with a hook & loop security tab and a functional D-ring. This pocket can accommodate an A6 folded map, or a notebook and pen/pencil, or smartphone in a waterproof case. In front of this is a smaller outer pocket with hook & loop security tab, ideal for keeping your compass close to hand, or for securing smaller energy gels, pens, pencils etc. when on the move. Within the high collar of the smock sits a slim pocket, which can be used to store rolled-up items such as a scarf, Buff or skull cap. Last but not least, the Softie Smock design also incorporates a harness compatible, muff-style, TS1 hand-warmer pocket. It can also be used for storing other essential items and will keep them safe due to the deep pocket and side zips that prevent items from falling out. Across the smock you will find various hook-and-loop patches, designed to accommodate APALS® Personal Identification (PID) LEDs, or 3M Scotchlite™ Reflective Tabs, helping to make you more visible in low-light conditions. External D-ring for LED torch etc. 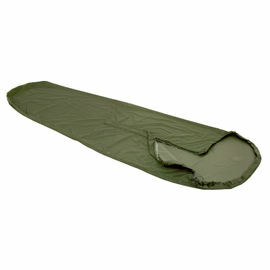 Snugpak MML3 Softie Smock - Olive is rated 5/5 based on 3 customer reviews. This smock is very well thought out and very useful for any winter activity. It is very light -yet warm, holds up very well in light rain, the pockets are just where you need them when wearing a pack. I have this with me every time I go into the hills in winter-either as a mid-layer if it is very wet and cold or as my outer layer in all other conditions. Love the thumb loops. This Snugpak smock is a fantastic piece of kit. I ordered it from Australia and delivery was quick. It's now sub-zero (Celsius) almost every morning where I live, and the jacket is incredibly light, very comfortable and as warm as toast. My partner also says it looks good on me as well, which is an added benefit. I'm 6'5' and 210lb with long arms and I normally wear XL or XXL, but based on the sizing information provided I bought the L size, and it fits perfectly. Highly recommended! Just as it says on the tin. This smock is well made and does its job perfectly.